Do you find yourself struggling with your sins? Take heart, you’re by no means alone! Many of our great saints, well aware of their sins and shortcomings, fought them on a regular basis with much prayer and penance. One famous example is from St. Padre Pio's Prayer after Communion with its haunting line “Stay with me Lord, you know how easily I abandon you”. And, of course, the great Apostle to the Gentiles St. Paul himself recounted his own inner struggles with his sinful inclinations in his letter to the Romans (7:15-25). That’s why when we came across this prayer for humility by the Carmelite nun St. Therese of Lisieux, we wanted to share it with our readers. It’s quite inspiring, and we can all relate to it on some level. It might seem somewhat out of character for St. Therese when she speaks of her conceit. She embraced humility and suffering for our Lord in part by mortifying her sense of self-love (as in “It’s all about ME”), especially when she was in the Carmel at Lisieux, France. O loving and gracious Infant Jesus, how full of love for us poor mortals is Thy divine heart! The fire of Thy love is burning day and night, emitting sparks of grace in the shape of countless benefits, showered on all men, even the greatest sinners. In order to comprehend the greatness of Thy heart, one would have to possess the love and wisdom of Thy dear Mother, of St. Joseph, or of Thy most devoted worshiper Father Cyril. How cold is my heart toward Thee; filled as it is with temporal and earthly concerns and the greatest self-love, there is no room left for a heroic love of God and my neighbor. What a miserable and wretched being I am! Thou, infinite majesty itself, most holy and most perfect, art most humble of heart; I, wretchedness and sin, am proud and conceited, and therefore also without peace of heart. Thou shouldst verily turn away Thy beautiful countenance from me, because I possess so little virtue. And yet I consider myself better than others, and even venture to criticize and belittle them! I know my own misery, and still I expect to be esteemed and praised, and even preferred to others! The least humiliation and neglect on the part of others pains me, and Thou art so humble, so forbearing, and so patient with the children of men! Divine Heart of my most loving Jesus infuse into me true humility and a right knowledge of myself, so that I may deserve to find one day favor in Thy sight. Give me grace to be humble and simple like a child, if I wish to go to the Father. Amen. Note that the “Father Cyril” she mentions above (also named Fr. Cyrillis on some sites) was an important figure in establishing devotion to the Infant Jesus of Prague in the 17th century. (There are more details about this devotion here). 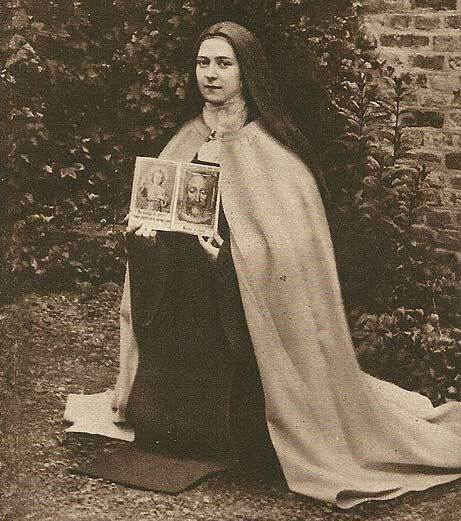 St. Therese, also known as the “Little Flower” (honoring her desire to be as one of Jesus' little flowers) served our Lord lovingly in the Lisieux Carmel from 1888 until her untimely death from tuberculosis at the age of 24 in 1897. She left this world relatively unknown, but it was her autobiography Story of a Soul that quickly brought her well deserved posthumous fame and acclaim after its first publication in 1898. Her moving account of her life as a Carmelite nun resonated with both religious and laity alike, and she was canonized in 1925 by Pope Pius XI. In this prayer, St. Therese appeals to our Lord as the Infant Jesus of Prague, with the confidence and honest supplication of a little child, to guide her to sanctity in the midst of her imperfections. This is well in keeping with her also being known as St. Therese of the Child Jesus, the name she took as a Carmelite nun. St. Therese’s “Little Way” has been a special source of inspiration for many. She reasoned that as an aspiring saint she wasn’t capable of the mighty deeds of various missionaries and martyrs for the faith. However, she realized something quite important, indeed vital, that ensured that she would become one of our greatest saints and one of only 36 Doctors of the Church: that doing everything for the love and glory of God was what mattered most. Even the smallest penances or acts of charity, such as offering up one’s suffering for the good of souls, or the most banal household chores, if done well with love for God and neighbor could bring one great graces and spiritual merits! In this prayer she seems to be chiding that part of her that nurtured the kind of toxic self-love mentioned earlier that afflicts much of humanity as well as God’s religious, and keeps many of us, if not most of us these days away from Him. Yet one gets the sense from reading passages from Story of a Soul that Jesus did indeed answer her prayer for the “grace to be humble and simple like a child”, as she turned over any of her doubts, aridities, and trials to Him. St. Therese’s focus was always on putting Jesus and others ahead of herself as part of her “Little Way”. Admittedly this wasn’t easy for her. It’s never easy for any of us. One gets the feeling from reading her autobiography, however, that Jesus made her sufferings more bearable and even sweeter at times! St. Therese made it a point not to return any rebuffs or rebukes from her fellow Sisters or her superiors with resentment or ill will. Early on in her time at the Carmel, when her Novice Mistress chided her for a cracked jar that she had not in fact broken, rather than protesting her innocence, she kissed the ground and promised to be more careful in the future. She carried that spirit of offering up sufferings and penances out of love for God and souls throughout her time at Carmel. On numerous instances she fought back retaliatory instincts when faced with disagreeable circumstances or people. For one example, St. Therese wrote in Story of a Soul of an instance where "A holy nun of our community annoyed me in all that she did; the devil must have had something to do with it, and he it was undoubtedly who made me see in her so many disagreeable points. I did not want to yield to my natural antipathy, for I remembered that charity ought to betray itself in deeds, and not exist merely in the feelings, so I set myself to do for this sister all I should do for the one I loved most." And sometimes when the temptation was very severe, I would run like a deserter from the battlefield if I could do so without letting the Sister guess my inward struggle. One day she said to me with a beaming face: 'My dear Soeur Thérèse, tell me what attraction you find in me, for whenever we meet, you greet me with such a sweet smile.' Ah! What attracted me was Jesus hidden in the depths of her soul—Jesus who maketh sweet even that which is most bitter." Striving for sanctity in this life is never simple. But Jesus can make it easier if we allow him to help carry our burdens as His yoke is easy and His burden light (Matt 11:30). He can also cool immoderate desires and tamp down our all too natural proclivity to envy others, sometime to the point of out and out dislike, if not hatred, if we can be receptive to the graces He wishes to give us to do so! The main thing we hope this prayer inspires in our readers (as well as her autobiography, available here and online here) is a greater desire to put Jesus front and center in our lives as much as possible. If at first you feel this isn’t working or even possible don’t feel intimidated. Keep at it. The Little Flower’s "Little Way" can help with this. As St. Therese does in this prayer, and did throughout her short life, give Christ your failures and shortcomings; turn your face not your back to Him (Jer 32:33); and ask Him for the graces you need to do better. And don’t ever be afraid to ask for His forgiveness for your sins and His grace to resist them better in Confession! St. Therese once said "after my death I will let fall a shower of roses". Such was her desire to help others that two months before her passing away from tuberculosis on September 30, 1897 she stated "I feel that my mission is about to begin, my mission of making others love God as I love Him, my mission of teaching my little way to souls. If God answers my requests, my heaven will be spent on earth up until the end of the world. Yes, I want to spend my heaven in doing good on earth." And she has indeed been busy with her figurative (and sometimes literal) roses! Numerous miracles have been attributed to her, such as these described here. They started happening soon enough after her death for her to be declared a saint in 1925, as mentioned earlier! Don't hesitate to ask for her help in your earthly struggles with sin and sickness as well with prayers such as these on our site!